The latest addition to the growing lineup of Fujifilm X series lenses is the smallest in the system: the XF 27mm f/2.8 pancake lens. This wide normal pancake promises high image quality in an extremely tiny package. It’s also the second Fuji lens to come without a dedicated aperture ring, presumably due to the small size. Let’s take a look at this tiny optic and see how it fits into the Fuji system. As you’d expect from a pancake lens, the XF 27mm f/2.8 is a very small lens. In fact, it’s not much larger than a standard Fuji rear lens cap. It’s a little thicker and a little larger in diameter than that, but when putting the rear cap on the lens, it seemingly doubles in size. The lens is extremely lightweight and is constructed with a high quality plastic shell, a metal focusing ring and a metal mount. 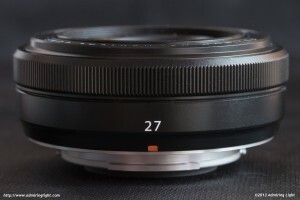 There isn’t a lot to the XF 27mm, but what is there is very tightly assembled and well made. The focus ring spins a little too freely for my taste, but there is no play or sloppiness in the movement. Like the XC 16-50mm lens, the XF 27mm doesn’t come with a dedicated aperture ring like all the other Fuji lenses for the X-series. This is a somewhat annoying development, though I can forgive it on this lens. While there is space for an aperture ring, if one was present, it would be extremely close to the focus ring, and both rings together would be the width of your finger, thus making operating both rings independently rather difficult. The XF 27mm f/2.8 handles extremely well on any camera due to its small size and low weight. Essentially, it’s hard to tell there’s a lens mounted. 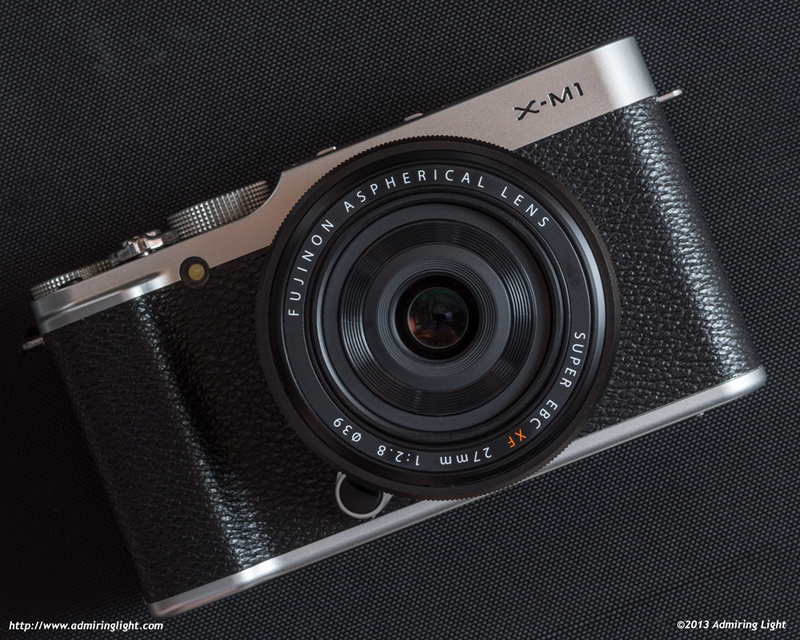 While it works just fine on the larger X-series bodies, the 27mm seems especially well suited to the diminutive Fujifilm X-M1. 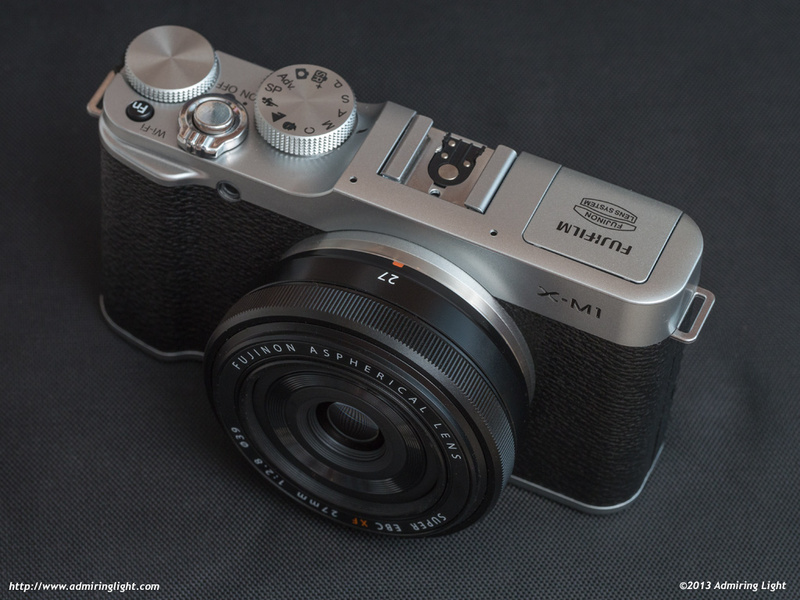 This combination provides a lot of imaging power in a very small package, and indeed, it’s quite easy to slip the X-M1 with 27mm in a pocket. While the not-quite normal, not-quite wide focal length of 27mm, equivalent in field of view to a 41mm lens on a full frame camera, may not be to everyone’s taste, it is a good compromise and jack of all trades type focal length that is just about perfect if you’re going to be out and about with a single lens. It’s wide enough to capture environmental portraits or other such shots, but long enough to be somewhat flattering to subjects and allow for more general use. One disappointing thing about the 27mm is it’s relatively long minimum focus distance of 13.4 inches. This is further away than even the Fuji 35mm f/1.4 can focus, and that’s with a longer focal length. The Panasonic 20mm f/1.7 for Micro 4/3, which is a similar pancake design with the same field of view can focus nearly twice as close, at 7.9 inches. The modest maximum magnification of 1:10 left me wanting for the ability to get just a little bit closer for some shots. The focus ring operates very smoothly, though I wish there was a little more resistance here. The programming for the focus-by-wire allows for rather quick manual focus should you choose to engage it, going from near to far in about 180 degrees. This is just about perfect, and makes manual focus with the 27mm quite enjoyable, especially with focus peaking activated. Since there is no dedicated aperture ring, the rear wheel on all Fuji X-Series bodies is used to control the aperture setting. Users of the X-Pro 1 and X-E1 possibly will need to update their firmware to use this lens, unless they’ve taken advantage of the most recent firmware updates. The autofocus motor in the XF 27mm is a standard micro-motor, and is relatively loud. The speed of the autofocus is a mixed bag; sometimes it can grab focus extremely quickly, but when focusing a little further away than the previous subject, it takes longer, as it searches forward, then back. It’s about on par in speed with the XF 35mm f/1.4. Autofocus is generally accurate, though I did notice that the 27mm has a little harder time with low contrast subjects than most of the other Fuji lenses. In some cases, it acts similar to the way the Fuji X cameras and lenses acted prior to the latest firmware update, occasionally failing to find focus and throwing up the red AF box. This wasn’t a common occurrence, but it happened enough for me to notice it. Doubt I will be getting either the camera or lens. However I gaad ot write to compliment you on the text and accompanying images. really nice review with plenty of information. the boat on the peer picture is awesome, love it. Excellent, straight forward and comprehensive review. The image quality and size seem quite nice. I will probably get one, after the price on the used market comes down to a more realistic price. Thanks for the review, great pictures too. I think that I make more images with this little pancake than any other lens. I’ve got a pretty good assortment, including the Touits and I don’t feel that I’m giving up optical performance when this is on the camera. It makes for a nice, all-around focal length which is part of the reason I tend to grab it and run so many times, I suppose. I tend to agree with Craig Schroeder’s opinion of this lens. I own or have owned the XF 23mm, XF 27mm, XF 35mm F1.4, XF 60mm and the Zeiss Touit 32mm. In terms of sharpness, color, contrast and micro contrast, the XF 27mm seems to be the closest to the Zeiss Touit 32mm in its ability to make images “pop”. Although the XF 23mm is supposed to be the better lens, I find the XF 27mm renders colors more realistically and seems to render images more realistically. The colors and tones on the XF 23mm seem to ever so slightly “veiled”. itching to get this lens and wondering what you meant by that… does this mean a good surprise or a bad surprise? Pingback: ?????? XF27mm F2.8????????????????…??????? | ???????????? ?